Get Your Copy of Beyond Book Sales! 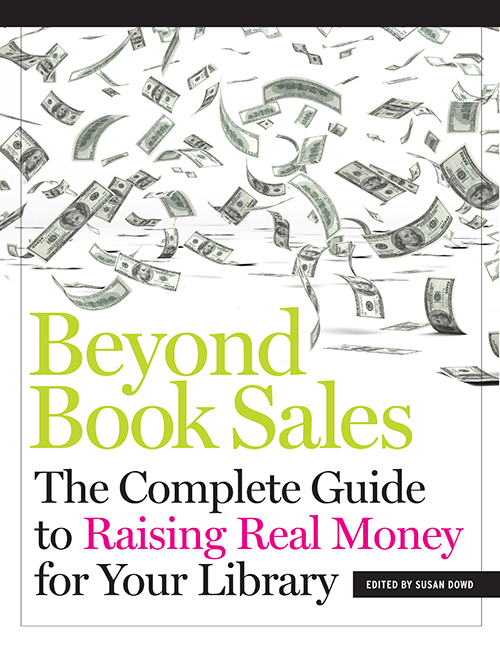 Whether your library undertakes only occasional fundraising projects or is well along in this effort and wants to become more successful, Beyond Book Sales: The Complete Guide to Raising Real Money for Your Library will guide you through proven methods of effective library fundraising. It will help you think about raising dollars in new ways and stretching beyond your traditional fundraising activities. In fact, because so many libraries already know how to do book sales successfully, this book will not include that topic, except to offer one piece of advice: When selling books or other merchandise, determine how you can connect your sale to other fundraising you do. This easy-to-use guide will help you develop a strong case for supporting your library. It stresses the importance of nurturing relationships and employing a broad range of fundraising tools and techniques, including the Internet. This book contains great tips, graphics, worksheets, and other tools to make expanding your fundraising efforts easier. Regardless of your level of experience, you will finish reading it with fresh ideas and an eagerness to roll up your sleeves and start raising dollars for your library. “Beginning with the critical importance of library fundraising and ending with samples of fundraising brochures, fact sheets, flyers and more, this book provides absolutely everything a fundraiser or potential fundraiser needs to know to be successful. This highly readable how-to-do it guide is written by perhaps the best and most well-known experts in the library fundraising world, and they don’t disappoint." "The foreseeable future for libraries...is one of permanent fiscal challenge, requiring strong advocacy and the building of strong community relations for effective and innovative libraries. This book should be the first resource for all librarians and library staff willing to take up the challenge and go beyond book sales." Susan Dowd is a staff member of The Friends of the Saint Paul Public Library, where she serves as Capital Campaign Coordinator and Special Projects Coordinator. She is also a consultant for Library Strategies. She holds a master’s degree in librarianship from Emory University and is certified in fund-raising and fund development from the University of Saint Thomas. She has authored a number of advocacy and fund-raising toolkits for ALA’s Advocacy University and coauthored a how-to book on mergers for Minnesota nonprofits. She collaborated on Beyond Book Sales: The Complete Guide to Raising Real Money for Your Library with fellow Friends’ staff members and Library Strategies’ consultants Liz Boyd, Sue Hall, Ann McKinnon, Wendy Moylan, and Peter Pearson. Who Can Help with Fund-Raising? Is a Membership Program Worth Your Effort? Why Is Planned Giving Important to Your Library and to Donors? What Can a Special Event Do for Your Library? Why Do Businesses Choose Library Sponsorships? Identifying a Need . . . or Why Should You Receive Grant Funds? Finding Appropriate Funders . . . or Who Will Support Your Work? Communicating Effectively . . . or How Do You Build Relationships with Your Funders? Afterword: What Does It All Mean? Like most successful writers, I have personally experienced the transformative power of the public library. Several years ago, I became aware of the tragic lack of funding for libraries. I found it shocking that states and municipalities were cutting into the very backbone of our educational infrastructure. I have made it my personal mission to do as much as I can for libraries, whether supporting them through my trust, Save the Libraries, or speaking to the Georgia State House on the importance of a well-read citizenry. I think my experience represents a microcosm of the greater tragedy that has struck library systems all over the world. In the United States, it is a fact that every dollar spent on public libraries returns $5 to the community. Eighty percent of our incarcerated juveniles are functionally illiterate. Adults who are unable to read are twice as likely to end up in prison as those who can. The math is simple: a child who reads does well in school. A student who does well in school goes to college. A college graduate earns a better living and not only pays more taxes, but has more disposable income to spend on services. They are also more likely to raise children who value education and reading and will in turn follow the education path of their parents. Contrast that with the millions of dollars spent every year on truants and in the juvenile justice system and you’ll find an exponential gain in investment by simply keeping the doors of our local libraries open. This is but one argument I’ve found helpful in persuading politicians and local businesses to get on board with library fund-raising: by investing in libraries, they are making a fiscally sound choice for their communities. This message is catching on. In the past few years, there has been a great deal of national media attention given to the plight of today’s libraries, and this attention has stimulated an uptick in citizens’ public support of their libraries. It’s difficult to predict, however, whether this attention and goodwill will convert into financial support; and, frankly, simply hoping that it will happen is not a good strategy. It’s time for libraries large and small to mobilize and focus on serious fund-raising. The consequences of leaving future library budgets in the hands of local public decision-makers alone will sound the death knell for many beloved libraries. It is an unfortunate reality that very few librarians are prepared to be fund-raisers. Even many of those with a master’s degree in library science are woefully inexperienced (and often intimidated) by the idea of asking for money. To make matters worse, the day-to-day challenges facing any library director leave precious little time for taking on the additional task of mounting a comprehensive fund-raising effort. That is why practical, achievable help is at hand in the pages of this book. This new resource will go a long way toward helping every librarian, trustee, Friend of the Library, and library lover avoid the pitfalls of fund-raising. In it you’ll find great ideas and specific suggestions for conducting all types of fund-raising activities. You’ll learn how to create a plan and identify partners to help you realize your goals. Outlined within this book are clear, concrete tools for implementing the activities you will include in your fund-raising plan. The authors have even included a gallery of examples of fund-raising materials created by libraries that are leading the way in the brave new world of library fund-raising. However you choose to approach this book, do it with the knowledge that whatever plan you implement, you are moving in an essential direction for your library’s future. I can think of no other warriors who are better prepared for battle than the men and women who have historically been on the front lines of literacy. Good luck! In this new millennium, public librarians, staff, and library supporters have reached an overwhelming conclusion: If public libraries are going to remain strong, people must get creative about funding them. The old model of banking on public revenues and occasional special funds—and hoping for the best—has gone the way of the card catalog. It has been replaced by purposeful library fund-raising designed to keep existing programs and services strong and provide opportunities for innovation. Library fund-raising is beautiful in its flexibility. It can be adapted to meet the needs and resources of public libraries and communities of any size, ranging from the smallest library’s book or bake sale to huge urban library galas and generous corporate underwriting. It can be simple or sophisticated. It can involve the efforts of a few people or hundreds of people. And the best news of all? It can be sized to fit your library perfectly. Regardless of the size or complexity of library fund-raising, it is always about forging and strengthening relationships with the stakeholders in a library’s community. The American Library Association (ALA) believes that private fund-raising is essential for U.S. libraries’ future survival. Under the leadership of President Roberta Stevens in 2010–2011, the ALA deepened its resources for private fund-raising, developing the association’s first online fund-raising toolkit. The toolkit was added to the ALA website’s “Advocacy University” as part of its wide array of online help for libraries seeking advocacy and fund-raising assistance. Whether your library undertakes only occasional fund-raising projects, or is well along in this effort and wants to become more successful, the chapters that follow are designed to guide you through proven methods of effective library fund-raising. They will help you think about raising dollars in new ways, about going beyond your traditional fund-raising activities. In fact, because so many libraries already know how to do book sales (and other kinds of sales) successfully, this book will not include that topic, except to offer one piece of advice: when selling books or other merchandise, determine how you can connect your sale to the other fund-raising that you do. For example, take advantage of the interest in your sale to promote membership in your Friends organization, as well as annual, special, tribute, and memorial giving. Whenever possible, gather names of customers at your sale and add them to your database for future fund-raising solicitation. Instead of reading more about sales, however, you will learn the importance of developing a strong case for supporting your library, nurturing relationships, employing a broad range of fund-raising techniques (including the Internet), and moving your library’s fund-raising from hit-or-miss to solid and successful. Part I, “Focus on Fund-Raising,” will help you think through your fund-raising needs and position your library to be a strong partner for private supporters. You’ll be guided through the process of assessing your library’s strengths and challenges, developing a fund-raising plan, building an effective fund-raising team (perhaps through your current board, Friends group, or Foundation), identifying potential funding partners, and building relationships that benefit both your library and its funders. You’ll learn to understand what motivates donors to give generously and why thanks and recognition are important. Throughout Part I, you will find paths to the “Fund-Raising Toolkit” where there are easy-to-use tools that break down new challenges into manageable tasks. In Part II, “Roll Up Your Sleeves,” you will find a wealth of good advice and more practical tools for a wide range of fund-raising activities, from the simplest annual fund to the grandest gala. If you have a small annual fund effort that needs improvement, or want to begin an annual fund-raising campaign, start here. If you have ever considered soliciting memorial, tribute, or major gifts—or if you know that planned giving (such as gifts made through a will) is important but don’t know where to begin—there are several chapters that cover these in detail. If you want to identify opportunities to partner with businesses (as library sponsors or underwriters) and to apply for grants from corporations and foundations, this book can make both of these feel easy and natural. If your library is in serious need of capital improvements, but you find the thought of raising large sums of money through a capital campaign terrifying, Beyond Book Sales: The Complete Guide to Raising Real Money for Your Library will hold your hand through every step of that multi-year process. If you feel daunted by online fund-raising, you can learn how to adapt your website and utilize social networks to use the Web effectively for library fund-raising. If you believe that everyone loves a party, library fund-raising events can run the gamut from punch and cookies to black-tie galas with best-selling authors. Your library’s special event “sweet spot” is somewhere along that spectrum, and this book will help you find it for maximum results. Regardless of your level of experience in library fund-raising, you will finish this book with fresh ideas and an eagerness to roll up your sleeves and start raising dollars for your library.